350. Traverse or to-and-fro motion. 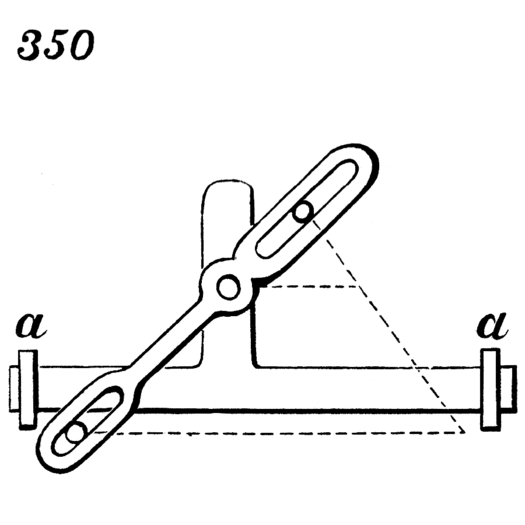 The pin in the upper slot being stationary, and the one in the lower slot made to move in the direction of the horizontal dotted line, the lever will by its connection with the bar give to the latter a traversing motion in its guides, a, a. In Brown’s illustration, the bar’s vertical portion would appear to interfere with the fixed pin. We have altered the bar in our animation to correct this and have added ribs to more clearly show its motion.